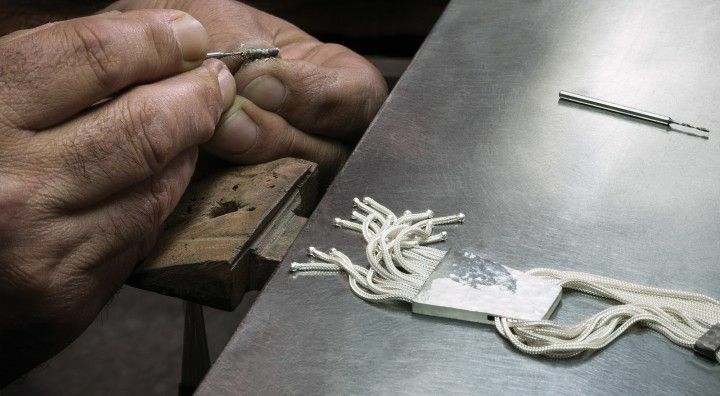 The Topázio factory in Gondomar preserves the totally manual techniques and traditional production methods, thanks to the experience and mastery of a great team of craftsmen who individually work each piece. The plant includes a mould production area, which, over time, has collected a unique portfolio in Portugal that allows Topázio great versatility in creating new pieces. 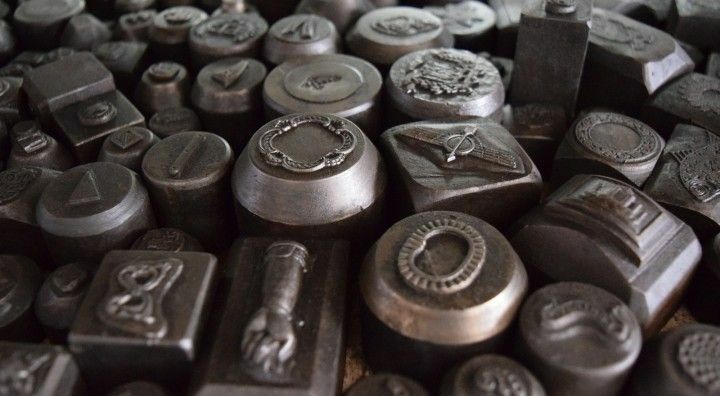 Some of the machinery used to press the metal, such as the iconic Topázio friezes, date back to the 60s and 70s. In the manufacturing room, dozens of craftsmen melt, sculpt and polish the pieces, paying special attention to detail so every piece is perfect, authentic and unique. Everything begins with an idea that is then turned into a sketch, which then becomes a technical drawing. Then the dies and cuts that are needed to stamp and work the piece are made internally. 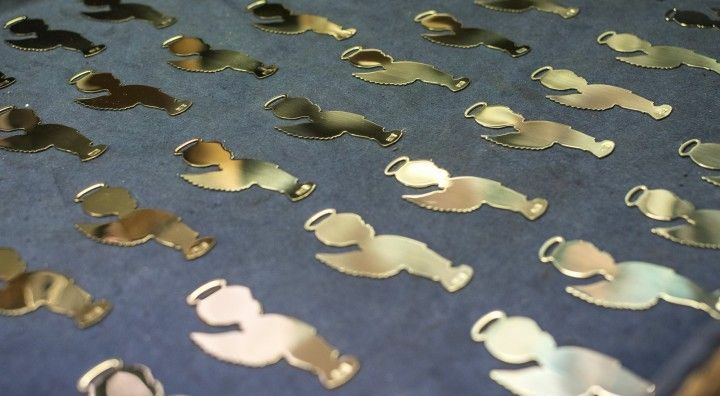 At this stage, the raw material, silver or brass (used for silver-plated items) is prepared to be cut by a guillotine, depending on the item's requirements. Most items are composed of various component parts (normally stamped and drawn) that are soldered together using various kinds of solder that allow for successive welds. Some pieces are chiselled or hand engraved. For example, salvers begin the process with stamping, they are then enriched with other components soldered around the edge, they are turned over at the ends to make them more resistant and then they are chiselled at intervals between the components to ensure their authenticity and manual character. After the soldering and chiselling process, the pieces are polished with cloth or sisal brushes and burnished with cotton brushes. 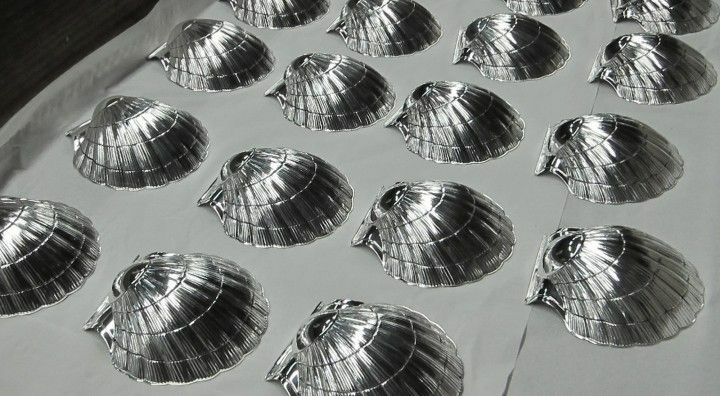 If the pieces are to be put in a silver bath, once the brass pieces have been burnished they are subjected to a galvanic process of cleaning and silver electroplating, giving them the silver shine. After all the work dedicated to transforming a technical drawing into a silver or silver-plated piece, the most important pieces are given a black patina to make the motifs stand out, followed by a final burnish. The pieces are then thoroughly checked according to inspection plans and the proper testing for each kind of item. The pieces only move on to packaging after they have been approved. When the piece is ready to be shipped out to the customer, it goes to packaging where it is packaged and handled by specialised staff who certify that the pieces reach the customers in perfect conditions.